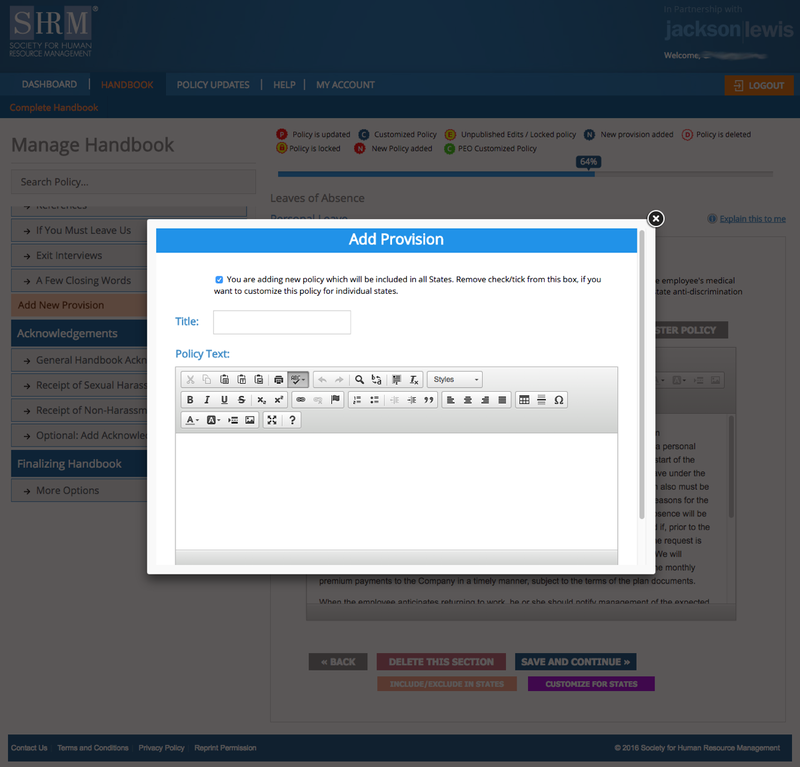 ​​​SHRM offers two options for creating an Employee Handbook for your company: a free sample template, or a premium, customizable online service. The Sample Handbook is a simple download, free for SHRM members. The download is a simple Word document that you can modify as necessary. For a customized handbook, the SHRM Employee Handbook Builder takes the work out of creating and maintaining an employee reference manual, and it offers both digital and printer-friendly access to the output. With state-specific filters and customizable fields offering pre-populated staff policies and procedures, the platform’s drag-and-drop, step-by-step interface is simple to use. 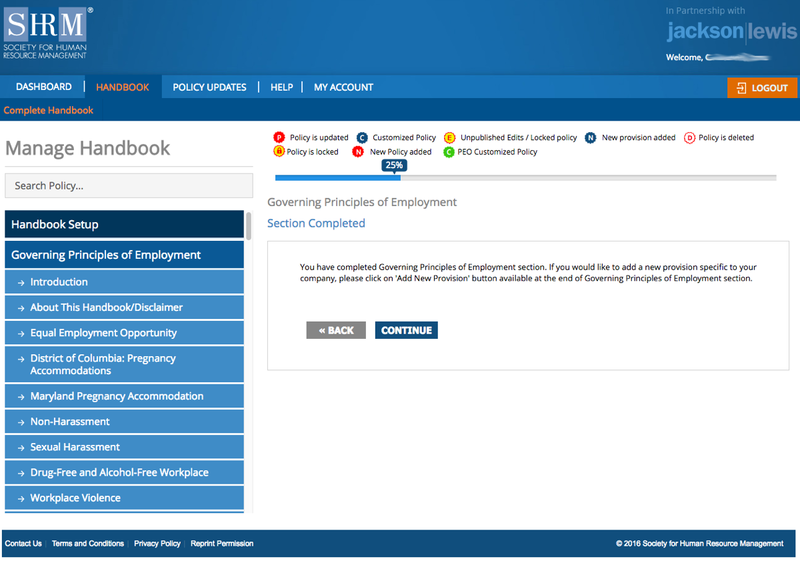 The everyday policies offered in the SHRM Employee Handbook Builder reflect the latest federal and state workplace compliance guidance, as vetted by the platform’s legal partner, Jackson Lewis. As a SHRM Employee Handbook Builder subscriber, you receive regular alerts for any state or federal law changes that occur during the annual subscription term. The Sample Handbook is available only to SHRM members, and may be downloaded and modified for your organization. It is intended to be a sample, and it may or may not reflect the compliance issues relevant to your state, locality or organization. Any employee handbooks should be reviewed by your legal counsel for compliance with federal and state laws and regulations and should be modified to suit your organization's culture, industry and practices. Are you already subscribed and saving time building and updating your employee handbook? Creating and updating an employee handbook can be overwhelming, costly and expose you to unnecessary risk. 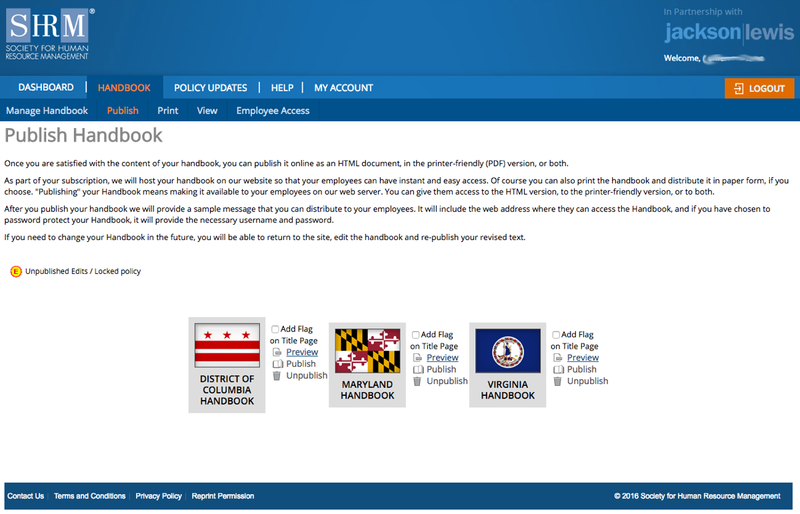 With SHRM’s Employee Handbook Builder (EHB) you’ll save time, money and get peace of mind that your handbook is up-to-date with today’s ever changing employment policies. The SHRM Employee Handbook Builder is a browser-based system, unlike software products that require you to download files onto your desktop. 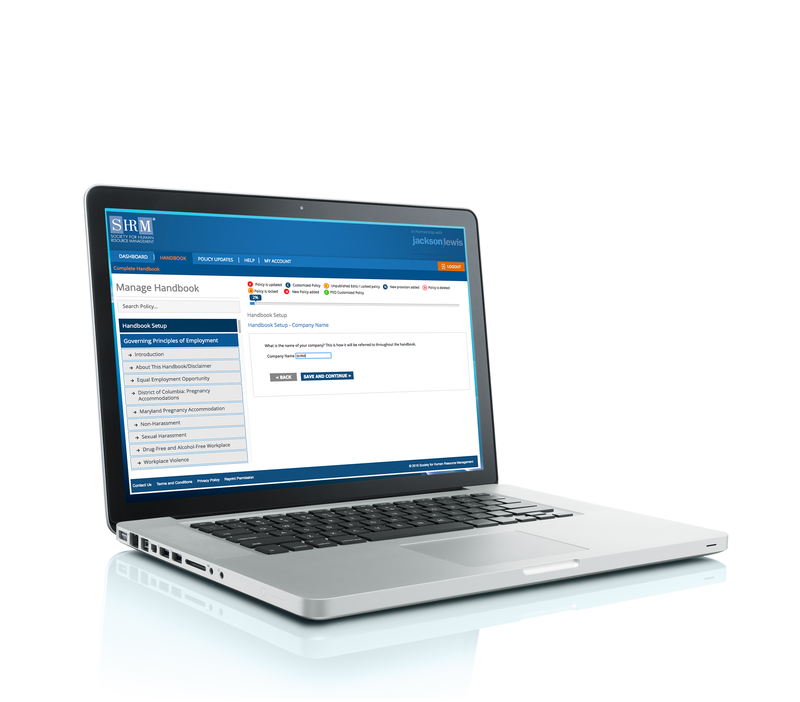 With the Handbook Builder, you can build, access, and update your handbook from any computer with a browser and an internet connection. Your handbook is hosted on secured servers and can be made available over the web to employees with real-time updates you provide. Quickly and easily create a custom employee handbook – creating a custom employee handbook is expensive and time consuming. With SHRM’s EHB, you can include your logo and custom policies at no extra cost! Stay compliant with state and federal policies - staying on top of the latest policy can be overwhelming. SHRM's EHB delivers state and federal updates straight to your inbox and automatically updates your handbook. Avoid time consuming downloads and limited access - our employee handbook builder is fully web-based - no need for any software downloads! Which states are available for the employee handbook? All 50 states are available on our Employee Handbook Builder platform. Is the employee handbook builder something I can access from anywhere? Yes! The Employee Handbook Builder is housed in the cloud. It can be accessed anywhere with an Internet connection including on tablets and smart devices. How much does the SHRM Employee Handbook Builder cost? The annual subscription costs $350 and gives you access to all 50 states and federal updates. Can I include a company logo, watermark, or header and footer in the handbook? Yes! 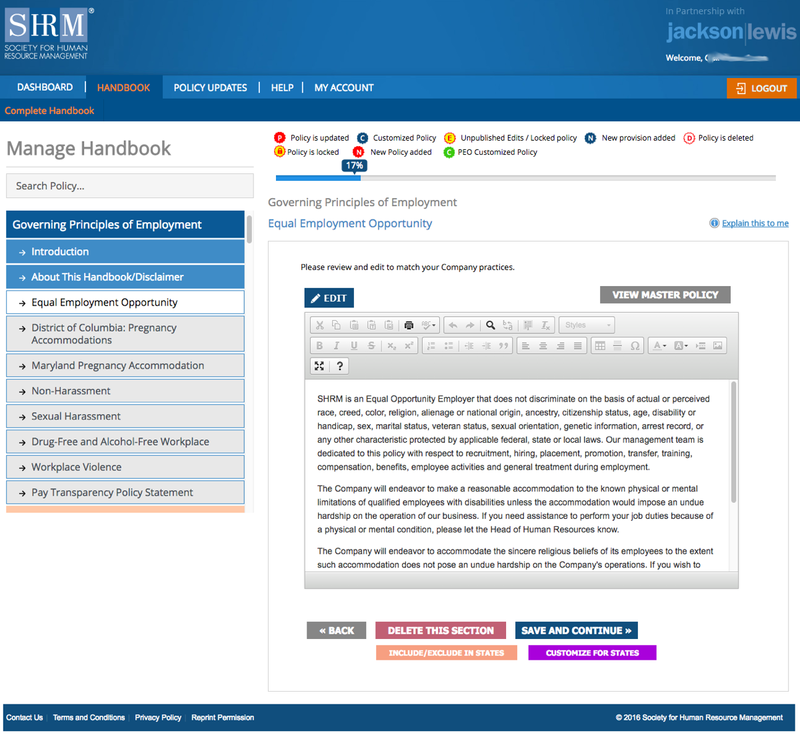 SHRM’s Employee Handbook Builder allows you to customize your handbook to ensure a cohesive image for your employees. 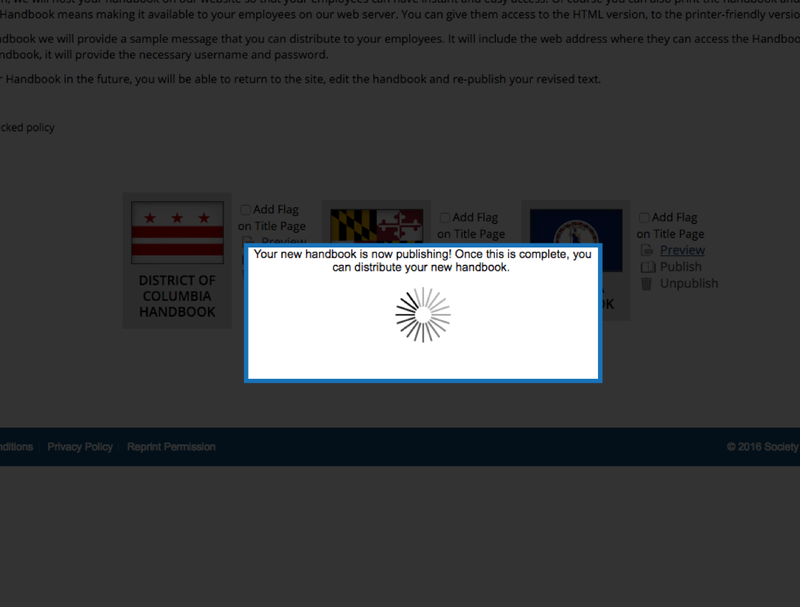 Do I have to download anything to use the employee handbook builder? No! The employee handbook builder is completely web-based. Unlike some employee handbook software, no downloads or installations are required. My company handbook is out-of-date, can we import our old handbook into your system and edit it? Because our employee handbook builder uses expertly crafted language provided by our legal partners at Jackson Lewis, importing outside language is not possible. This ensures that all the federal and state provisions and language requirements are included and legally compliant. After each provision you will review the provided language and have the ability to amend or replace that language with your own. Can we send a printed version to some employees and provide others with online access? Absolutely! Your employee handbook is hosted online for you and your employees to access privately and securely. You also have the option to print copies. Professional printing services are available at an additional cost. 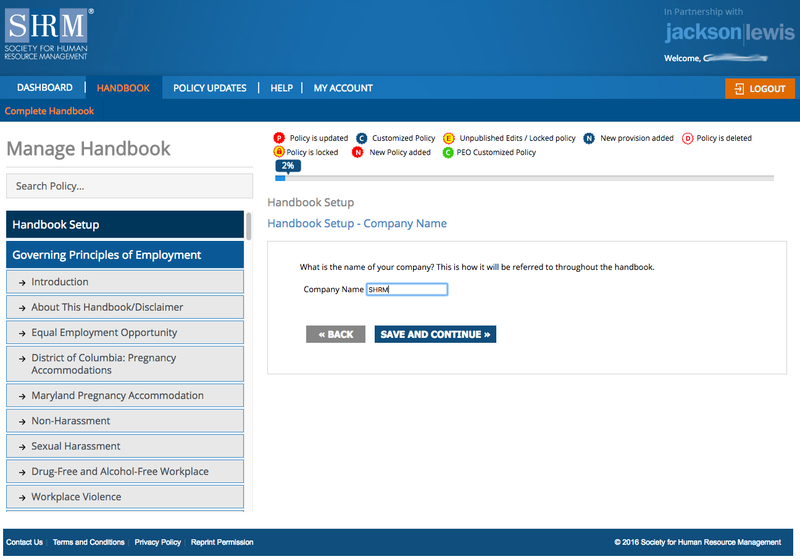 Are you able to update the employee handbook once you have created it? Yes, you can edit the handbook at any time during the life of your subscription. We have a smaller company, do you cover whether we need to include FMLA or not? Yes! Once you purchase your handbook you’ll take a short online interview where you will be asked questions relating to FMLA (Family Medical Leave Act) and provided language for that policy. This interview process will indicate what policies your business is subject to. Does your employee handbook cover city policies? Yes! Where applicable the handbook covers city specific policies. What happens when new “laws” or “policies” are released in my state? Any time a provision is updated or added to a handbook you’ll receive an update sent directly your inbox with detailed instructions on how to update or add the provision. My company operates in one state, but we have two to three employees that work in another state. Do I need to purchase an extra handbook? You do not have to purchase extra handbooks as all states are included in your subscription to SHRM's Employee Handbook Builder. However, if you have employees operating in multiple states it is recommended that you maintain employee handbooks in each applicable state.